The last five decades of the nineteenth century in the history of Punjab had indeed witnessed an epochal and rapid transformation of the social, economic and spiritual domains of the vast former kingdom of ‘the lions of the Punjab’. The valiant Sikhs had been cheated - not defeated - by the dark deceit of the ‘Gora’ - the white British and the tragic treachery of traitors from within. The British had moved quickly to consolidate their position with a comprehensive political and administrative plan of action for the newly annexed kingdom of ‘Koh-i-Noor’, a territory of historic strategic significance to the vast empire of Malika Victoria. The far reaching fall out of the uprising of 1857 had resulted in several rewarding dispensations - territorial and financial - for the Cis-Satluj Sikh rulers. The confused and demoralised Sikh soldiers who were licking their wounds after the loss of their popular and powerful kingdom were also sought to be mollified. The British administrators, to consolidate their control in a long term perspective, debated in depth the strategy to win over the hearts and minds of the Punjabis, the Sikhs in particular. They apparently invested considerable thoughtfulness in ‘Operation - Peaceful, Prosperous and Loyal Punjab’ undertaking unprecedented efforts to understand the Sikh mind and their energetic creed as a faith distinct from the fluid Brahamanical-Hinduistic traditions. A special space was soon sought to be earmarked for them, as a martial race in the British army - deeply reinforcing their particular physical identity with the Five K’s. The British administrators, in a good or bad faith, soon unleashed the ‘game of numbers’ of each faith - and it was never a looking back in the history of India. As could indeed be expected, an inevitable and never-ending tussle on the religious turf - with the innumerable attendant sects and sub sects of each religion and also the explosive caste divides among the Hindus and Sikhs - broke out soon to claim and reclaim the new and the lost religious and spiritual territories - more obviously in terms of the head count. The first comprehensive and reliable census in Punjab in 1881 reported a Sikh population of 1,716,114 - believed to be a gross underestimation because of census commissioner Ibbetson’s definition ‘appearing to be a Sikh’ - with a strong impression among the Sikhs that it had decreased from one crore when they were rulers. The British soon manouvered to slip into playing the role of an umpire - a schematic arbiter - with its own axe of Faith (Christianity) to grind - adopting a biased and motivated, albeit cautious approach in the battles among ‘warrior-preachers’ of the myriad hues of competing faiths. The Sikhs indeed faced a complex situation of being caught in the middle of cataclysmic changes of this unprecedented socio-religious and cultural-educational fermentation. The determined and state-supported Christian missionaries had started making daring forays of poaching on the Sikh elite - with the deposed Maharaja Dalip Singh and Kapurthala Princes as their earlier trophies. The large scale conversions to Christianity from the ranks of numerically significant but forever the humiliated and insulted as ‘Achhut - the untouchables’ among Hindus / Sikhs sent shock waves into the citadels of the self-aggrandizing custodians of the local religions. The rulers of Sikh states in the Southern Punjab and their attached feudal elements; the new aristocracy groomed by the British and also so many saints-scholars-soldiers had felt the urgent need of an organized body of the Sikh Panth to counter the newly emerged serious dangers posed by the Christian Missionaries and other reform movements including Brahmo Samaj, Arya Samaj, Ahmadiyas not to speak of the countless rebel sects of the mainstream religions. The result was the founding of the Sri Guru Singh Sabha in Amritsar on July 30, 1873. The body was registered with S. Thakur Singh Sandhawalia (1837-1887), a cousin of deposed Maharaja Dalip Singh, as President, and Prof Gurmukh Singh (1849-1898), Bhai Ditt Singh Gyani, Bhai Mayia Singh (1862-1928) and Bhai Jawahir Singh (1859-1910) as the other office bearers. Prof Gurmukh Singh as secretary and Giani Ditt Singh as in-charge of the office worked day and night to spread the mission of the Sabha. The Sabha was, however, soon rocked by differences. The immediate cause of rift was over Baba Khem Singh Bedi (1832-1905), a descendant of the first Guru, seating himself over the ‘mattress’ adjacent to the Granth Sahib and receiving ‘obeisance’ - ‘Matha Tekna’. The reform-minded group of Gurmukh Singh, Ditt Singh and Jawahir Singh parted ways and launched a parallel Singh Sabha in Lahore on November 2, 1879 with the avowed aims of undertake the contingent necessary reforms in restoring the pristine character and practices in strict conformity of the teachings of the most exalted Shri Guru Granth Sahib - the Living-Eternal-Guru. The war of words - and even court battles raged between the Amritsar and Lahore Sabhas for many years till the main protagonists passed away, within a couple of years of each other, at the turn of the century. The life of Bhai Ditt Singh (b. April 21, 1850; d. September 6, 1901), the first to qualify formally the degree of ‘Gyani’ from the Oriental college, in the first ever examination held in 1878, is an inspiring saga of immense scholarship and dedicated service in the cause of the Sikh Panth during a very controversial and challenging period. He was born in a pious Ravidasia family - a low caste according to the practice of prevailing norms of social order - and his father Divan Singh was known as a Sant for his piety. Himself an admirer of the liberal and free-spirited Gulabdasia sect, his father sent him at the age nine years to be educated in the Dera in Teor, near the town of Kharar. 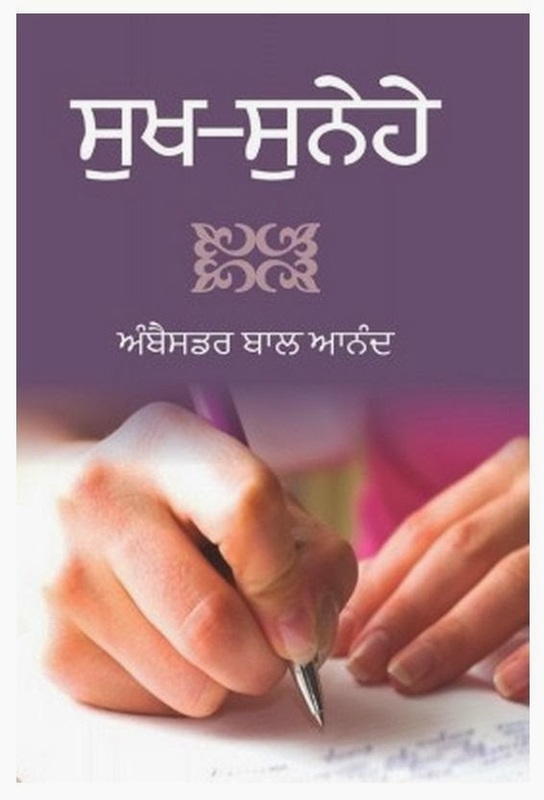 Ditt Singh studied diligently for about seven years learning the various traditional studies in Gurmukhi, including grammar, prosody, Vedanta, Niti shastra, etc. Then he shifted to the main center of the Gulabdasis at Chathiawala, near Kasur and was soon initiated as an independent preacher. The contact with Jawahar Singh, a former Gulabdasia, who had joined the Arya Samaj led Ditt Singh also into this new wave organization. The two friends were soon drawn into Sikh fold by Bhai Gurmikh Singh, an educated activist for reforms in Sikhism and Ditt Singh’s life was transformed for ever for his most luminous scholarly contribution to the Sikh resurgence. 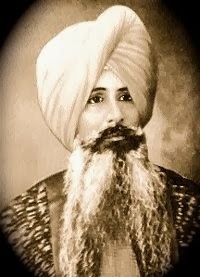 Apart from being one of the leading lights of the Singh Sabha movement, Ditt Singh was in the unique category of his own for inspiring the Sikh youth to follow the path of knowledge and being the pioneer to promote Punjabi language and literature. He was a crusader for establishing educational institutions and played a crucial part in the establishment of the Khalsa College in Amritsar. He pioneered, in close collaboration with Prof Gurmukh Singh, publication of journals and newspapers in Punjabi for social and spiritual awakening of Punjabis. He was amazingly prolific in his journalistic, literary and religious writings. According to Pritam Singh, a senior civil servant who retired in 2000, and has since been making Herculean efforts to retrieve and laboriously edit / publish the complete works of Bhai Ditt Singh, Giani Ji wrote 72 books - 60 in exquisite traditional poetry. The available works have been classified as consisting of the eight authentic accounts of the Sikh martyrs; seven biographies of the Sikh Gurus and twenty five didactic booklets and declamatory brochures explaining at length the Gurmat point of views on the raging controversies of his time. He has employed his immense talent as a poet and prose stylist in all his works. He was indeed a precursor and path finder for the entire next generation of Punjabi writers in the line of Bhai Veer Singh. ignorance is synonymous with sin. Gyani Ditt Singh has been rightfully, though belatedly recognised as the father of journalism in Punjabi. The British had undertaken the monumental ‘Project Punjab’ pushing and rushing province headlong from medievalism to modernity. The magical machine of the printing press of Gurmukhi was as much as much an engine new era as gigantic rail road projects. Prof Gurmukh singh and Gyani Ditt Singh and their close friends were all children of the spirit of the time and the saga of the ‘Khalsa Akhbar’, started in June 1886, indeed symbolized the new dawn. Gyani ji who edited 695 issues out of 699 of this first formidable weekly of the Panth till his last in September 1901 must be the most influential wielder of the pen in Punjabi. When Prof Gurmukh Singh was ‘thrown out’ of Panth by the feudal clique controlling the Amritsar Singh Sabha by adopting the Gurmata-religious edict, Gyani Ji stood up to valiantly defend him by writing the most convincing articles in Khalsa Akhbar and succeeded in forcing the withdrawal of the unjust edict. When Gyani Ji published in May 1887 ‘Swapan Natak - A Dream Play’, a satire targeting the false practitioners of Sikhism, the Amritsar faction dragged him to court in a defamation case - the conviction by the lower court imposing a fine of Rs 51/- was reversed by the higher court on April 30, 1888. The untimely demise of Gyani Ji on September 6, 1901 had occasioned a deep and wide spread grief in the Panthic circles. 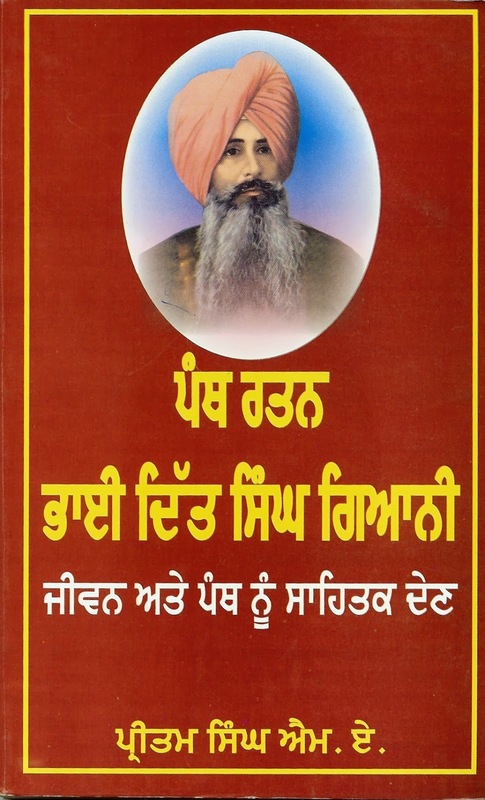 Bhai Vir Singh paid rich tributes to his twenty years senior and precursor in a real sense of Sikh ideology, Punjabi literature and journalism by penning three poems and two touching tributes. A few lines are worth quoting, “Sade vicchon sajjan bhara guunm ho giya, bhai: Ditt Singh editor gyani, panth kare vadiaaee - A thorough gentleman has departed from among us, brothers: Ditt Singh, Editor and Gyani is most admired in the Panth.” The two other poems namely, ‘Long Lasting Sleep of Bhai Ditt Singh,’ and ‘An Elegy of Bhai Ditt Singh’s Pen’ express a deep sense of loss and bereavement of the Sikh community in the death of its most gifted scholar. The fairly longer ‘Editorial Note’ in Khalsa Samachar of September 11, 1901 titled, ‘Qaum Looti Gayee - The Nation has been Looted (Robbed)’ appeals that, “…The loss suffered is irreparable and nor can we ever repay for his services, but the best thing to preserve the memory of the dear departed is to make the best arrangements for the completion of the interrupted education of his son…” Gyani Ji’s son Baldev Singh ‘Sher’ did become a highly qualified doctor but found the doors in India to all the positions commensurate with his qualifications shut in his face - because of his being born in a low caste! H.W. McLeod has narrated how the curse of caste had vitiated the life of Dr Baldev Singh - even at the edge of the world in distant New Zealand! One hopes that the Panth Khalsa in Punjab and its cultural historians will fully embrace and put this most scholarly son of soil on a higher pedestal of the honor that he had earned by his noblest pen.